Rajiv Surendra (the rapping mathlete from Mean Girls) read Life of Pi, discovered it was being adapted into a major motion picture, and embarked on a 10-year journey to land the role of a lifetime - but this is not a journey of goals and victories; this is a story of obsessively pursuing a dream, overcoming failure, and finding meaning in life. In 2003 Rajiv Surendra was acting in Mean Girls, playing the beloved rapping mathlete Kevin Gnapoor, when a cameraman on set gave him a copy of Life of Pi, inadvertently changing the course of his life. 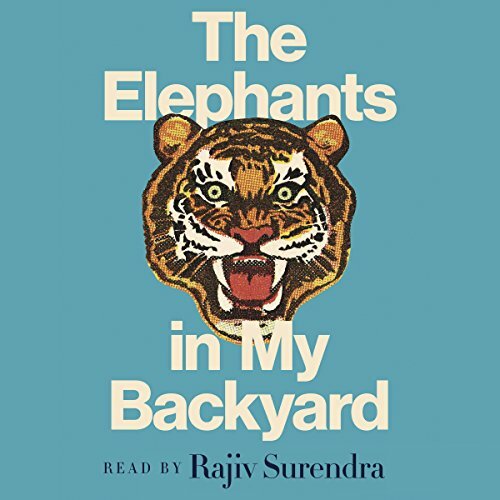 Rajiv dove into the novel, mesmerized by all the similarities between Pi and himself - they are both five foot five with coffee-colored complexions; both share a South Indian culture; Pi lives in a zoo, and Rajiv grew up in Scarborough, Ontario, right beside the Toronto Zoo. When Rajiv learns that Life of Pi will be made into a major motion picture, he is convinced Pi is the role he is destined to play. To land the role, he knows he must embody the spirit of the 16-year-old Tamil schoolboy. In a great leap of faith, he quits university and buys a one-way ticket to India. Thus begins his enchanting and bumpy years-long journey from Toronto to the sacred stone temples of South India and the actual private school in Pondicherry that the fictional Pi attended, to rural Maine, where Rajiv befriends a real-life castaway, and culminating in the most unexpected of places - the cobbled streets of Munich. Poignant, funny, colorful, and absolutely unforgettable, The Elephants in My Backyard is an inspiring tale of taking risks and following one's dreams, of process and determination, and looking back on one's endeavors - be they successes or colossal defeats - with new appreciation and meaning.